To walk upon the fallen leaves of the Ginkgo tree is very nearly to walk upon a river of gold. It is a sight of such pure beauty that the Speakers whisper sweet blessings to the earth, spinning a preservation upon the leaves where they lie, so the golden carpet won’t fade to black as we tread upon the ground. I was reminding myself of how lucky I was to have enough Speaking to join the Speakers of the Ginkgowood when Amber chastised me during a Speaking lesson. The Speakers were the people who made my home such a beautiful spectacle, and I needed to remember that it was an honor to join them. My Speaking was a gift from the Ginkgowood, a power that had come to me without rhyme or reason as a child, which I needed to make the most of. What would I do with the neighborwood’s gift, aside from use it? “You can’t ask it to go against its nature,” Amber said, rubbing her temple. “You’re asking it to come to harvest soon, that’s what it already does in the fall,” she said with a shrug. I was used to Speaking branches into different forms, but this was the first time I’d tried Speaking a tree into doing something new. Amber had reminded me before I climbed onto the branch that it was the same principle; I was asking the life’s essence to do something, but that didn’t mean it wasn’t hard. Eventually, I was able to cajole the branch into bringing forth a handful of tiny pink blossoms. The blooms were small and pink, perfect and delicate and desperately out of place among the fan-shaped Ginkgo leaves. Daylight filtered down through the boughs as I walked home after the lesson. The forest was beautiful. Since it was early autumn, the yellow of the leaves was fresh; the preservation upon them—the first of several before the season would be up—still glistening as it sank in. I was marveling at the yellow carpet, enraptured as always, when I was bowled over, and fell in a mess of limbs. 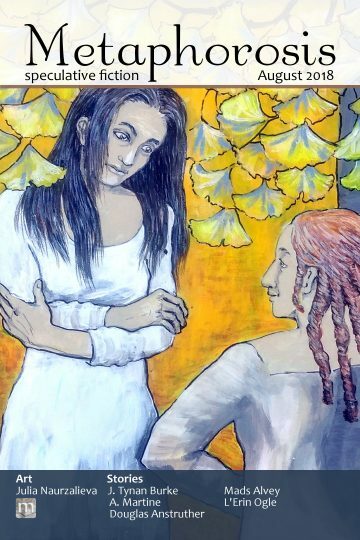 There, half on top of me, I saw a young woman with gentle features and elbow-length red braids. She was wide-eyed and startled, and unfamiliar to me, but the red maple leaves pressed—almost painted—on the backs of her hands marked her as a Speaker of Maple. I myself had a pair of yellow ginkgo leaves clinging to the hollows of my collar bones. “Sorry! I’m so sorry,” I said, extricating myself from underneath her and standing back up. “Where are you headed?” I asked. I noted how the deep red of her dress stood out in the carpet of soft gold. “I was hoping to find the Ginkgowood’s Speakers. I’m from the Maple neighborwood, and I think we need help. Hopefully of a sort that the Ginkgo Speakers can provide.” Her voice wavered as she talked, a pleading evident in her words. She looked exhausted. I reached out my hand. She took it and squeezed my fingers. “I’m only a novice Speaker, but I can bring you to my teacher,” I told her, pulling down the collar of my shirt to show her the leaves there. She let out a small sigh of relief and let me begin leading her back along the path I’d just come down. The branches overhead arched in deliberate patterns, Spoken maps that could lead you anywhere in the wood—should you know how to read them, or at least, how to ask the trees for help. The Maplewood girl followed me with wide eyes. Through hollows in the stands of trees I could see my neighbors working—cooking, mending, sewing, and gardening, all tucked into homes Spoken from the trees. We passed the home of another Speaker, but one I didn’t know well enough to introduce to the Maplewood girl. His home was on the edge of a clearing, where the trees wouldn’t be bothered by the heat and smoke of his—amazing—baking. The branches overhead weren’t yet bare, turning the air a golden yellow. Even the Maplewood Speaker seemed impressed with the gold all around her. My great-uncle August had been a trader between the woods, and he’d described the Maplewood as having a rich carpet of red and an ever-present sweet scent. Even growing up with that, the Maplewood Speaker seemed impressed by the Ginkgowood. My mentor Amber lived deep in her tree, which had been Spoken into a gentle nest of a home many generations ago. Its trunk was wide and it seemed to fold into itself somewhere, where the sloping boughs met a twist in the trunk. I turned into the hollow space and followed gentle, worn-smooth, spiraling steps downward. The root ball had been spread out and shaped with Speaking until it formed a burrow; a home with kitchen, bedroom, common room, library, and pantry. I loved the warm glow of the place, the way the amber lamp roots had been Spoken into shelves and earth had been Spoken solid and smooth. The Maplewood girl followed me closely. I always found the place a comfort, and I could tell that the girl was also settled some by the calm space. “Amber?” I called out. “Bee?” The slight padding of footsteps floated into the room around her voice. Amber had been stocking the pantry, it seemed—her tree was female, granting her ample fruit without a single whisper. She wasn’t one to waste this gift. She smiled a broad, true smile. “Bee! What brings you back so soon?” She had an apron on over her blouse, and her black hair was pulled into a bun—as it was only when doing housework. Her eyes flicked to the foreign Speaker, and I saw in her eyes that the girl had caught her interest. “Um, hello,” the strange Speaker began. “I’m here on behalf of the Maplewood.” She held up her hands. “We have a problem. The Maplewood has a bit of a shortage of Speakers—well, Novices really.” Her fingers were intertwined, wringing with her words. “A shortage in that we have none.” The words were heavy, hanging in the air like syrup. That explained her age. I had been sixteen when I was tested for the Speaker’s gift, and wouldn’t become a full Speaker until the end of the cycle—just after my 21st birthday. Yet here she was, this Maplewood Speaker, a full Speaker of her wood, and she was maybe a year older than me. “So, nearly twenty years,” Amber said. “Yes.” The Maplewood Speaker pursed her lips. “We can’t fix this on our own. If we knew what was causing us to lose our connection to the wood, we could reknit it; if we knew where the Speaking was going, we could try to cajole it back to our children. But that’s not working. It’s just…leaving.” When she said those words, the Speaker seemed ready to cry. After a moment of silence (save for the gentle crackling of the fire in the corner) Amber Spoke a soft suggestion of calm. Her words settled over us: a warm, soft blanket. The Maplewood Speaker’s hard worry melted some, softening into a gentler concern. “Gia.” What a lovely name. Gia nodded at Amber. She must have known that the Speakers would want to talk together before offering help to her and her people, no matter how desperate the situation felt to her. I silently thanked Amber for having Spoken a comfort around us. Amber pulled off her apron and turned to me. “Bee, would you please find someplace for the Speaker to stay?” It was my turn to nod. “She can stay with me,” I offered, smiling at the girl as she stood beside me. As Amber began to mutter to herself and look for something, I guided Gia back up the stairs. She was quiet, and remained that way as I led her to my home. The calm hung on our shoulders as we walked, giving the neighborwood an unspecifiable quality—almost dreamlike in its softness. It had been years since I’d had calm Spoken onto me. It was a common Speaking upon children, and one simple enough that most anyone could spin it in some fashion. Even so, it had been a long time. I’d forgotten how nice it was. My home was a warm, open one, made from four trunks Spoken into arching walls enclosing a single room a dozen feet off the ground. I was halfway up the flattened branch stairs, which twisted and wound up to my front door, when I felt the calm slip away and the cool bite of the air return to my awareness. Gia paused—she was also feeling the edge return to the world. I hesitated, watching her, concerned but hesitant to ask her how she was doing. But she quickened her pace once again, following me into the comfort of my small home. The wood had been Spoken smooth and worn soft. The branches of the four great Ginkgos that made my home wove a sturdy, solid basket of floor and ceiling. I held open the heavy curtain over my home’s front entrance for the Maplewood girl and saw her smile as she ducked inside. The room was wide and simple. My bedroll sat against one wall; several overstuffed pillows rested on the floor around a low table; and my large, full kitchen (with both a stove and a hearth!) took up nearly half of what was left unclaimed. I’ve always found it a kind and open place, and Gia seemed to find it a pleasant place to be. I fixed some tea, broth, and shortbread cookies. She was quiet. Rain came to the Ginkgowood that night. It pittered down through the leaves, and I could feel the cool dampness of the air that always accompanies a soft drizzle. The rain picked up as the night wore on, the thrum upon the interlaced-branches overhead growing more insistent as the night grew deeper. I slept lightly and little, rising early in the small hours of the morning. The Maplewood girl tossed as she slept, her mind no doubt wracked with worry for her wood. As I moved about the room, putting water on the fire and warming my toes, the Speaker stirred. I glanced over, afraid I’d disturbed her, but she didn’t move again. I set some acorn tea to steep, some honeyed beechnuts to roast on the hearth, and considered what to do for breakfast. I had plain leavened bread, but the Maplewood was far enough from the Ginkgowood that the trip took three days, even running intermittently. She wouldn’t have had a hot meal in that time, so I figured I ought to give her one. I tried to cook quietly, so as not to disturb her. She slept curled into herself, her arms tucked tight against her torso. Her hair had slipped out of its braids in her sleep, ringing her head with red. The spill of hair framed her face, softening the taut lines that spread across it. She woke only when the sun was spilling across the floor of my home, the leaves of the neighborwood tinting the dawn light with the richness of gold that had always been my favorite thing about that time of year. Gia didn’t wake slowly, but started up with a breathless gasp. Her legs were tangled in the blanket, causing her to twist up further in her anxiety. I dropped a pan of heavy biscuits onto the stove and hurried to her side, skidding and scraping across the ground as I came to my knees beside her. “What-” she stammered. She rubbed at bleary eyes with the heels of her palms. “You’re in the Ginkgowood,” I said, my voice as low as I could make it. She trembled, her ankles still twisted up. I reached out a hand gingerly, offering her what comfort I could. “You’re safe. The Speakers of Ginkgo are discussing how to help the Maplewood.” My words were hushed, as soothing as I could make them without slipping into Speaking. My guest blinked the sleep from her eyes and looked at me. Her eyes were so wide that I thought she might begin to cry. But she just nodded, reaching out to take my hand. She held onto me and took a deep breath, her eyes closing again as she settled herself. As she breathed, her chest rising and falling in rhythm, I wondered what it must be like in the Maplewood for her to be consumed by such deep and desperate fear. “I presume you’ve no word,” Gia said flatly after a handful of long moments. “Nothing yet, no.” She nodded, unsurprised yet still disappointed. I patted her hand and waved toward my kitchen. “Let’s eat.” Her grip on me tightened as we rose to our feet, but she let me go, settling for following close as I walked over to the stove. I’d gathered the beechnuts to cool in a bowl, steeped the morning tea, cooked a small pot of hot cereal, and baked two sweet palm-loaves. My tree was filled with the smell of hot grains and honey. To top it all off, I retrieved a small jar of blackberry jam from the back of my top shelf. I had several of the small jars, as my mother was fond of making the sweet preserves during the summer berry season, and I was particularly glad to have something for my weary guest. I handed Gia one of the bowls and offered her the jam. I took my own bowl and walked over to the low table in the corner, scooting past her to pull over a pair of sitting cushions. She sat down in one fluid motion, folding her legs up underneath herself. She put her bowl down across from mine as she settled, but then just stared into it. I waited for her to start, but she didn’t. “Um, Miss?” Her face stayed blank. “Gia?” I repeated. She blinked and looked up at me, eyes glassy. I nodded. “Gia. You need to eat. You’re exhausted.” She nodded, and slowly moved to pick up her spoon and start to eat. I watched her as subtly as I could while eating my own breakfast. Though it was more indulgent than my typical breakfast, she seemed to enjoy the sweet roll with blackberry jam. I was proud of my cooking. She scraped insistently at the bottom of her bowl and I could tell that I was right — she had really needed to eat. When she finally set the spoon down, apparently satisfied that she’d gleaned all that she could, I rose. I took both of our bowls over to the stove. I set mine on the counter, but spooned some more cereal into hers. I brought Gia a new cup of tea along with her bowl, and told her that I was going to fetch more water. She nodded, blowing gently on her drink. And so I descended from my cabin with a large wooden bucket in hand into the early morning fog of the Ginkgowood. The mist was cool on my skin and I couldn’t help but smile as I walked. The neighborwood looked particularly soft in the morning light; the haze of fog smoothing all the wood’s edges. I walked barefoot, enjoying the dampness of the leaves. I left my bucket by a small creek and continued on to Amber’s home. Guilt nagged at me, telling me I should’ve been honest with Gia, but I shook it as best I could. There had been no need to worry her further. “Amber?” My voice was barely above a whisper. I cleared my throat. “Amber?” I called out, loud enough this time. “Bee? I’m in the pantry,” she said from somewhere off the main room. I followed the sound to find her on her tip-toes, reaching towards the back of her highest shelf. “Morning. I hope your walk was peaceful.” I nodded. With that, I left. The morning was already light, effusing the wood with a gentle glow as the light met with the last of the morning mist. I jogged back to the stream and filled the bucket. It was heavy enough that I had to slow my pace to keep from sloshing water down my front. The morning mist had disappeared by the time I made it home. The day was warming up. When I got to the top of the stairs at last, water bucket in hand, I found that Gia was sitting exactly where I’d left her. I could tell she’d moved; the cup in her hands was steaming, so she must have refilled it. But her feet were folded in that particular way, and her back was slumped just the same. “Gia, I’m back,” I said as I walked in, not wanting to startle her. “Hello, Miss.” She said without raising her head. “Bee, right?” She looked at me. Her eyes were watery, her face pale, but even so, she had an earnestness to her. “Yes.” I put the bucket down just inside the door. “Yeah, it’s Bee.” She smiled, but her smile was weak, watered down like sunlight through rainclouds – a visible effort, but hardly half the effect. I wondered what it was about her that compelled me to fuss over her as if she were completely helpless. After all, she was a full and proper Speaker, while I was still a novice. I hesitated, standing near her for another moment before returning to the counter, to scrub up after breakfast. Gia sat at the table. I watched her out of the corner of my eye, careful not to stare. I continued cleaning, and noticed for the first time that she didn’t have a bag. A three-day walk would’ve required…something. But no, there she was with only the clothes on her back. “Three days of rations in a pocket?” I raised my eyebrow. Her frailty suddenly made sense—her pale face; her exhaustion; her distraction. I fetched another cup of water and sat beside her. “Why did you run? Fifteen years without new novices, but now you run full tilt to a neighboring wood,” I asked. I didn’t say anything more to that, just handed her the water. I didn’t know what to say, so I just watched her. Her braids were loose, thin wisps escaping them. She was pale (quite unlike myself) but on top of that her fingers felt clammy. She was sick with worry, that much was clear. Without any better idea of what to do, I put my arm around her. For a half-second, she stiffened, her whole body tensing up as she whipped her head around at me, eyes wide. But just as fast, she softened and shifted her weight towards me. “Thank you,” she whispered, so softly that I wasn’t sure if she even intended for me to hear her. I patted her arm. “The Maplewood’ll be alright,” I said after another long stretch. Gia turned her head into my shoulder at this, something leaving her at the mention of her home. I almost regretted saying anything, but she wrapped her arms around me and I could feel her shuddering. Heat spread across one shoulder, and I held her as she cried. We sat like that for hours; until the sun was down and Gia was out of tears. When I started to move away, ready to roll out the sleeping mats, she took hold of my sleeve and followed closely. I could feel her nails through my shirt. She held my arm when we went to sleep, clutching me like I was the last thing between her and nightmares. I figured that was probably the truth, and lay as still as I could. The nest two days passed with agonizing slowness. On the morning after I visited her, Amber came by my home with a nutty spread and assurances that yes, she would let me know when the Speakers had made a decision, and to stop worrying. This left Gia and I to discover that neither of us was the particularly patient sort. I tried to distract Gia (and, to be fair, myself) during that time. I spent hours cooking complicated meals, with recipes I’d learned from my mother. I showed Gia the neighborwood, pointing out where Speaker May’s partner was weaving blankets for their future child; where my mother lived; and where the Ginkgowood held market days. I even spent hours relaying to her all of the stories that I had been told as a child about the nature of the Ginkgowood. I learned quickly that the stories that were told in the Maplewood were quite different, even when they were the same—in the Maplewood, Rabbit in “The Sparrow and the Rabbit” isn’t a baker, but a syrup maker, and Sparrow’s wings are red, not gold. The moments in between, when the air between us filled with anxiety, I would assure Gia that the Ginkgowood would not let her people down. On the morning of the third day though, one of the other novices showed up at my door. “Aiden?” I swept aside the curtain to see him there. His face was flushed and his breath caught in his throat. He was clearly in a hurry, though I wasn’t sure why. I glanced over my shoulder. Gia sat at the table, a curious expression on her face as our eyes met. I turned back to Aiden, a twisting in my gut. “I heard,” she said. I hesitated, waiting for her to continue. She didn’t. So I turned about and followed Aiden away from my home. Away from Gia. We walked quickly and wordlessly. Aiden was breathless with excitement over the prospect of making decisions with the Speakers. I was concerned for Gia. The neighborwood was still dark, a tinge of watery pink in the sky the only indication of the coming dawn. We wound through the trees toward a large clearing where everyone in the wood could gather. It was full of people — novices and Speakers and neighbors alike. At the sight of all the people, Aiden visibly deflated. When all of the Speakers and novices were present, the oldest Speaker—a wizened old man named Faa—stood. His golden robe seemed to dwarf him and his white hair rebelled against gravity, but his eyes had yet to cloud with age. As he stood, the clearing went quiet. “Good morning, all,” Faa said. “The Maplewood is in trouble. For some unknown reason, the Maplewood has no new Speakers, no new Novices. They are running out of Speakers.” A murmur rippled through the neighbors, and Faa waited for it to fall away before continuing. “For the past three days, we Speakers have considered how to help. At last, we have an idea to present to the neighborwood.” He turned and returned to his seat. Another Speaker, Tanner, stood and came forward. He was a sturdily built man, with a voice that carried over the assembled with little effort. He cleared his throat and took a deep breath before beginning. “We have decided that—if the neighborwood finds it acceptable, of course—we’ll send some of our Speakers to the Maplewood on a rotation. We’ll start with six-week rotations of three Speakers each. We’d also evaluate the effectiveness of the six-week rotation after several months, of course. When the Maplewood starts to have new Speakers again, we’ll leave.” Many of the Speakers nodded at this, sitting straight and watching the neighbors. The others tried to mask their malcontent, but I could see a handful shifting where they sat. “Is that all?” I asked, rather loudly. I hadn’t meant to open my mouth, let alone practically shout at a Speaker, but the solution that he offered seemed a pittance. His words lit a fire in my gut. I’d spent the past three days fostering Gia, a gentle, broken soul. Yet he dared insinuate that I wasn’t putting effort into this? I could see Amber sitting with the Speakers; she bit her lip as Tanner talked. “It took you three days to come up with your solution.” I replied. “Three days that I spent caring for the ill woman who came to us for help. She ran here from the Maplewood, desperate for help.” The neighborwood was usually a place of calm, of civility. I’d never lost my temper like this before, but it felt natural, the words insistent that I say them. My neighbors all seemed to frown as one. “Gia,” I interjected. Amber nodded. She walked me back to her home and sat me down at the table. In front of me, Amber placed a cup of mead, a thick stew, and a small glazed roll. She sat down with a cup of tea for herself, and waited for me to eat. When I finished, she insisted on a lesson in Speaking. “It’ll distract you, get your mind off all this,” she insisted. “I’ll ask Aiden to go check on her, alright?” she said. I followed her through the neighborwood to a stand of trees that wanted for care. Brambles crept up around their trunks, curling outward, abutting the path. I sat on the path and cradled a vine, careful not to prick myself. I whispered to it, wheedling the needles dull. Vine by vine, I Spoke away the brambles’ defenses. It was early evening before I finished to Amber’s satisfaction and she told me to, at last, go home. When I walked in, Gia looked up from the fire. She was cooking—I could smell tea and roasting potatoes. Her face was red from the heat, and she had strapped on the apron that I always forgot to use. She’d re-braided her hair, woven it into a plait that feathered into nothingness at the small of her back. I’d learned that playing with her hair was a nervous habit of hers, so the complex layering of the braid told me more about her state of mind than her words would. She stood there, her hand on my face. “I…we can make it work.” She said, wearing a sad smile that was as soft as her words. “My people, we’ll do our best, whatever it is.” Her pain and worry for her people wracked her, but she was better than she had been. She held herself together. “No, we’re going to do better. I have until tomorrow to come up with a better solution.” I sighed. If she hadn’t held me there, I would have turned away and shaken my head. “All the Speakers in the Ginkgowood took three days to come up with, ‘We visit from time to time and let them wait for a natural end to the problem.’” Three days reassuring Gia, wasted. Reassurance only helps, I thought bitterly, if everything ends up okay. Gia pulled me into an embrace. I could feel her pain, and my whole being ached in sympathy. Amber was right, I had taken on Gia’s pain. But I couldn’t bring myself to mind, not then, while we each held the other up as we hurt in tandem, mourning the Maplewood. I only let Gia go when I could hear the tea begin to boil. We ate, cleaned up, and then lay down for sleep, all in silence, though neither of us slept at first. We lay close enough to feel one another’s body heat. I didn’t slip into sleep even as the hours slipped past. All I could do was think, searching for some solution to the plight of the Maplewood. I watched Gia slip into an uneasy sleep as I thought. Even tossing and turning, soft whimpers and moans rising from her, her warmth, her presence, comforted me. A palmful of hours before dawn, she started weeping in her sleep. I touched her on the arm, hoping to pull her out of the dream. She mumbled, shaken from the pain, and curled into me. My heart skipped a beat, but as Gia fell back into her dreams, I wrapped my arms around her and held her close. She smelled like sugar, and I wondered if the whole of the Maplewood smelled like syrup. The thought made me smile, my face buried in her hair. It was straight, unlike mine, and soft in a different way. She settled against me then, like she was seeking my warmth in her unconsciousness. I whispered a Speaking of sweet dreams to her. I felt the warmth of my breath held against my face by her hair. I hadn’t Spoken anything onto another person in ages, and the feeling of whispering to the core of Gia was so pure I had to hold my breath to keep from tightening my arms around her. There was a delight in Speaking to trees and brambles, of course, but they don’t react quite the same way—it doesn’t echo back. The thought that I had then was so abrupt that I squeezed her tightly without meaning to, causing her to stir. “Sorry,” I replied. “Go back to sleep.” She nodded and nodded off fast, thanks to the sweet dreams I’d Spoken for her. With Gia curled against me and an idea in my mind, I fell fast asleep, dead to the world, if only for a few hours. When we woke, we ate quietly, and then I led Gia to the great clearing in the neighborwood. It was filling up when we got there. We sat and waited for the meeting to begin. Gia didn’t ask me if I’d found a solution, and I didn’t offer to tell her that I had—I wasn’t sure what she would think. When the whole of the neighborwood had gathered, Faa stood. He gestured to me and asked if I had a suggestion for the Speakers. Gia and I rose together. I took a deep, shaky breath, and then explained. “I’ll give my Speaking to the Maplewood. All of it. They can have every drop,” I said. I heard a number of gasps, and Gia’s small hand snatched at my arm, trying to pull me to face her. But I continued. “Speaking is part of who we are, yes, but that fact is exactly what means this should be possible! What we Speak to is the essence of a being, and Speaking itself is part of our essence. It’s natural, inherent—it should be possible to influence.” I took a deep breath. “You can Speak the gift out of me and Gia can take it to the Maplewood.” I turned and nodded at Speaker Tanner. “Until then, we may help them as you suggested, but after a cycle they will no longer need our aid.” Gia tugged harder at my arm but I leaned away from her, countering her weight with my own. The entire clearing was filled with silence. Stunned, confused silence. After several long moments where the clearing was quiet but for the rustling of leaves, the keeper of records, a Speaker named Gianna, rose to her feet as well. “I have less than half a cycle before my apprentice becomes a full Speaker. When they are ready to take my place, I’ll go and give my Speaking to the children of the Maplewood.” After she said her piece, she waved a reassuring hand to someone behind me. Turning, I saw that it was her apprentice, Speaker Conna. Their eyes were wide with shock, with anxiety. I looked away, embarrassed. Three more of the senior-most Speakers offered their Speaking to the Maplewood. I stammered, not having intended others to give up themselves, but each talked of a life spent in service to the neighborwood. Their Speaking would not be missed, each insisted. One professed a desire to bake pastries, another touched her belly and explained the want to care for her future child with all of her hours. I was dumbfounded, and sat quietly while the Speakers talked among themselves and decided to head out the next morning for the Maplewood. As the meeting ended, I found that Gia and I were holding one another’s hands with a mutual vice grip that had caused my fingers to go numb. “That was impressive,” Amber said, weaving towards us through the crowd of chattering neighbors as I rubbed feeling back into my hand. That afternoon, Gia, Amber, the four Speakers who’d offered their gifts most immediately, and I prepared for the long walk to the Maplewood. Blankets, water, food—everything that we needed, we folded and packed neatly into soft rucksacks. Unlike Gia, we took our time, readying ourselves before the three-day trip. The next three days were too long for my feet, but too short for my heart. Gia and I walked the whole way with our fingers intertwined, and slept in one another’s arms. As Gia led us between the wide trunks of maple trees, neighbors started to gather—it wasn’t often that people moved between woods, and they watched us walk. She led us to a wide clearing and had us wait for her to bring the Maplewood Speakers. The clearing seemed to be rather similar to the one in which Ginkgo Speakers had stood and offered their gifts. I looked around while we waited, intrigued by the beauty of the scarlet maple leaves. It wasn’t long until the clearing was filled with neighbors and Speakers. Gia wandered back towards us, standing just beside me. I heard a soft murmuring wash over the crowd, hushed whispers, then a number of sharp breaths. My breath caught in my throat, but I nodded. Gia guided me forward, her hand steady on my arm. Faa closed his eyes, a wide smile breaking across his face. “I’m looking forward to being just another man,” he said to us. Gia and I exchanged glances. I put my hand out; she patted me on the back and took a step away. Speaking the gift was like trying to control the flow of a stream with a bucket of water. I Spoke to Faa’s essence, asking that which was the very core of him to please disentangle itself from its eternal harmony. His soul didn’t give up Speaking eagerly, but slowly, my words found purchase. Faa smiled—it was a fake smile, the kind that is so perfect it seems as genuine as the smile of a child when they see the golden air of a morning in the Ginkgowood. I knew the truth, though. Faa’s being was echoing, separating itself from the gift inside him with great reluctance. It was, after all, a part of him. As I whispered to Faa’s gift, I felt warmth spread across my palms. The whole of the Maplewood watched us in silence. I felt the Speaking flow from Faa and come to rest solidly around me. It felt like a glove, like I had water swirling around my hands. Once I had pulled all of Faa’s speaking out of him, I whispered to it, telling it to find purchase within the neighbors here, within their children, and felt the weight of it drip from my hands into the earth of the Maplewood. As I finished, I could feel it starting to seep into the water, into the plants: into the Neighborwood and its people. When I finished, Faa opened his eyes. He straightened his back, as if a great weight had been lifted, and nodded first to me, then to Gia, then to the rest of the Maplewood. The other Ginkgowood Speakers exchanged nervous smiles. Their expressions were tentative and excited, and I could feel what they were feeling—after what I’d just done. At the edge of the clearing, I saw a young child watching us, bobbing up and down on the balls of their feet, full of energy. A man dressed in a deep red, similar to that of Gia’s clothes, squeezed the child’s shoulder. His fingers caught the fabric of the child’s shirt, twisting it up in five little swirls of shadow. I caught Gia’s eye—her face was higher than I’d remembered. It took me a moment to understand why: she’d been slumped down for the past four days. At length, she had straightened her back, a weight lifted. A smile came from somewhere deep within her, and from her, tears fell onto the carpet of scarlet below us.